LIFX, a company making a Wi-Fi enabled, multi-color LED light bulb, has raised $12 million in Series A funding led by Sequoia. 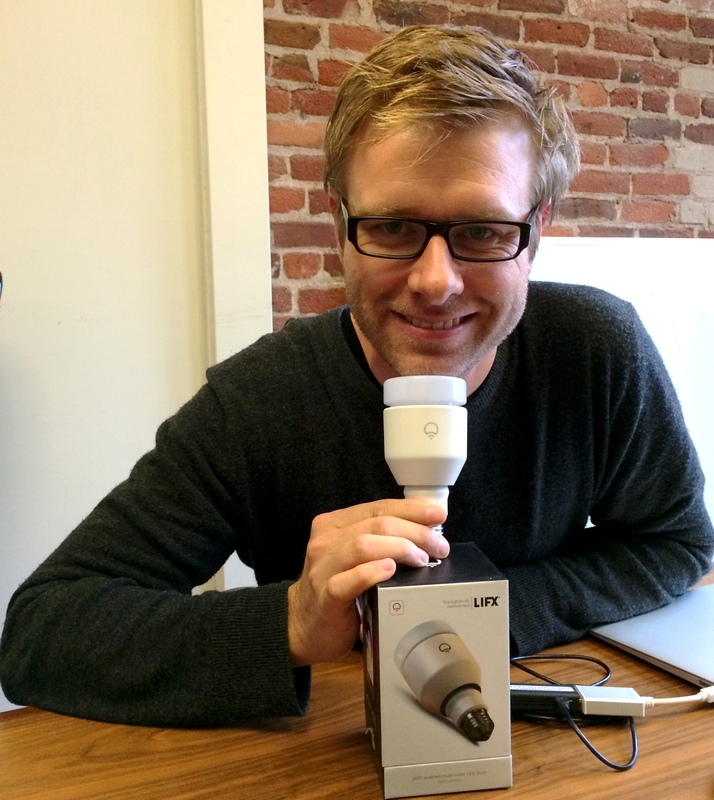 Along with the funding LIFX said its light bulbs, which sell for $99, are now on sale to everyone. So far LIFX has raised $16.6 million in funding, and it plans to use the latest round for sales and support of the product. The company, which raised $1.3 million via Kickstarter in 2012, shipped its first batch of bulbs during the first quarter of this year — about a year later than it originally anticipated. It offers two types of light bulbs at the moment — the Edison screw and a Bayonet mount common in Australia where the company was founded. Later it plans to offer a downlight. The biggest question for any consumer considering the LIFX bulbs will be how it compares with the many other connected bulbs on the market — most notably the Philips Hue bulbs. Like the Hue bulbs, the LIFX bulb offers the full array of LED colors (TCP lights, which are the other popular choice, only offer whites), but because the LIFX bulbs use Wi-Fi, they don’t need a hub like the Hue does. However, the Hue bulbs are cheaper with a starter kit containing 3 bulbs and hub going for $200. Additional bulbs are $60. However, the Hue app leaves a lot to be desired, so it’s possible that LIFX, which like the Hue is open to other apps and systems integrating with its lights, can gain market share by offering a better app experience. I will have to check out the bulbs and app to see how they compare. In the meantime, the world of connected lights is only getting hotter, with an array of features built into the light bulb — from speakers to presence detection. It’s unclear to me what the end game is for Sequoia with this investment given that a light bulb — even a $99 light bulb — still doesn’t seem like a venture-worthy investment with the kind of margins and hockey-stick-like growth that could lead to an IPO. However, as we are seeing with Google acquiring Nest for $3.2 billion and then Dropcam for $555 million, the end game may just be getting Apple, Google or another larger player to shell out a ton of cash for the next hot trend. I have four LIFX bulbs. The colors are nice, but managing them via the iPhone app is kludgy enough that I don’t do it anymore. Maybe they can fix the software and the annoying dimming that happens as the bulbs come on the network while they’re at it. Fun to wow friend with, but after a month, it’s just a light bulb set to a color that you will forget about. Networked lightbulbs for $60, I guess we’re at that place now. this is more for public spaces than homes. I bet Android versions could be be much cooler than iPhone. Change color when you walk into the room, voting on color with other people, that sort of thing. Hubs are such a dumb idea, like we need another piece of hardware for our lights? License it to Sonos, do a tie-in with Pandora to change lights to the music instead of the basic dumb light show… so many ways to improve the service and the product. Maybe that’s what the $15M is for. For those not familiar with the differences between the two, LIFX will give you brighter light (1000 lumens for LIFX vs. 630 for Philips hue) plus deeper blues and greens. The Philips lights require a small hub connected to your router, but this has both plusses and minuses, depending on your perspective. LIFX color accuracy is poor at very low brightness levels, but unlike Philips hue, can smoothly dim down to 0% without a sudden drop off at the end. As Stacey mentioned, there’s also the price difference, though Philips has a whole huge product line from hue bulbs to light strips, all the way up to fancy $4,000 3D printed lamps that look like they’re from the future. For those of you that can’t decide, there’s a 3rd party app that lets you control Philips, LIFX, and Belkin WeMo all at once. This round of investment from Sequoia is huge news. It’ll be interesting to see how 2014 plays out. With this announcement, the ilumi guys appearing on Shark Tank, and Samsung / LG making announcements about home lighting products, we might actually get some competition in the space and see prices drop. I think a better app could be differentiator for LIFX in the short term, but the direction of home automation is in integration of devices into ecosystems that could be controlled through a single app. This app would allow you to control any device in your system, and be configured to coordinate multiple devices (IFTT). Wifi would remove the need for a hub, giving it an advantage over Hue, but other (include Samsung, http://www.businesswire.com/news/home/20140603006386/en/Samsung-Unveils-Industry-First-Bluetooth-Mesh-Network-Enabled#.U6gykBbo0Vg ) will have Bluetooth Smart (BLE) lights available, which would not need a hub. Yes, exit strategy for Sequoia is purchase by Google/Nest/Dropcam. I think Apple isn’t playing the same game as Google, in that they are focusing on being the center of the home automation system rather than the peripheral devices. I dislike that we have to mention IFTT here. The home automation industry needs to agree on a protocol that everyone uses. How many times have we had this discussion? and enjoy the mention of IFTTT. Neat integrations for the most part and the automation of washing, drying, heating, cooling times is going to be a cool add-on. Hacking together a billion dollars worth of life-saving home automation with third-party software they don’t control will be interesting. Wonder if IFTT will get a bump in usage from this. Neat integrations for the most part and the automation of washing, drying, heating and cooling times is going to be a cool add-on.